Whilst recording at Kiltearn we were approached by local people and visitors from England, America and South Africa seeking the graves of relatives or an ancestor of the 5th President of America. We conducted many impromptu tours and received valuable information from visitors – it was truly a community project managed by Susan Kruse MBE of Arch and Nosas member. Burial practices differ across time and culture. 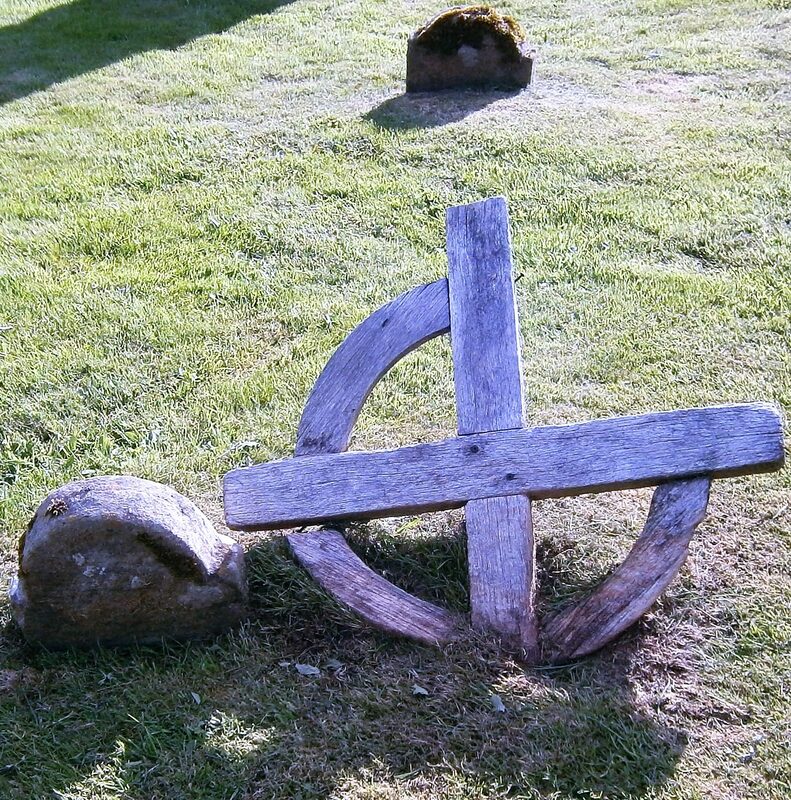 Cemeteries in Scotland have come under the control of the church since the 7th century. The 1560 Reformation had a major impact upon burial traditions. Memorials within the church were not permitted after the Reformation. Pre-reformation burial monuments include pre-historic burials (Bronze Age cists), Pictish stones, Viking burials (Hogback tombs) and medieval tombs. Post reformation monuments include flat and coped stones, chest and pedestal tombs, table stones, headstones, mural monuments and tablets, grave boards, crosses and rusticated monuments. After 1918 rows of small, uniform headstones became usual. During the Georgian and Victorian periods there was an upsurge in burials due to increased population. The Crematorium Acts of 1902 and 1952 led to cremations becoming more popular but apparently there is now renewed interest in burials. This may require deeper burials in the future or the re-use of graves, another contentious issue and a valid reason for conducting grave stone research. Kiltearn ancient burial ground was closely associated with the old parish kirk, the remains of which are an important part of the history of the area and an iconic feature of the village of Evanton. 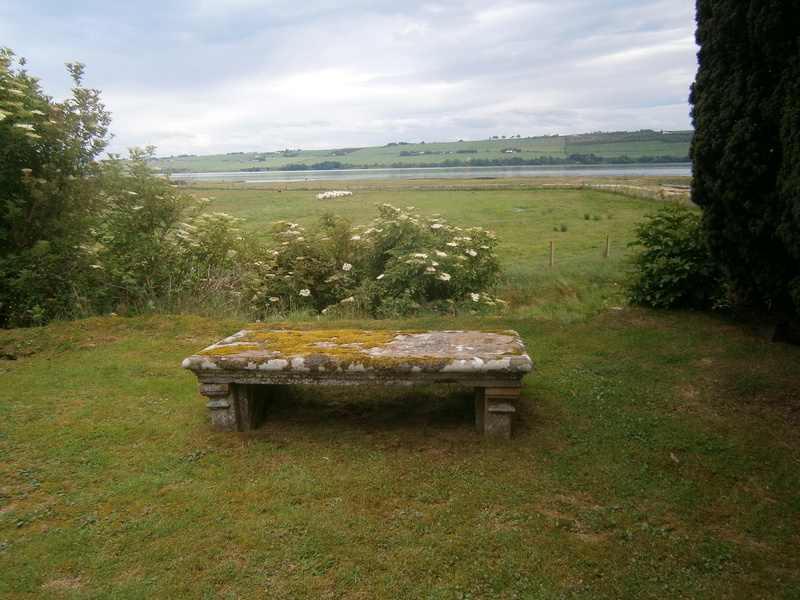 Other associated buildings include the nearby manse and a ruin, used as a fishing station in the 20th century, which has the appearance of a medieval chapel or perhaps was built to look like one. There is documented evidence for two medieval chapels on the Balconie estate whose exact locations are unknown. 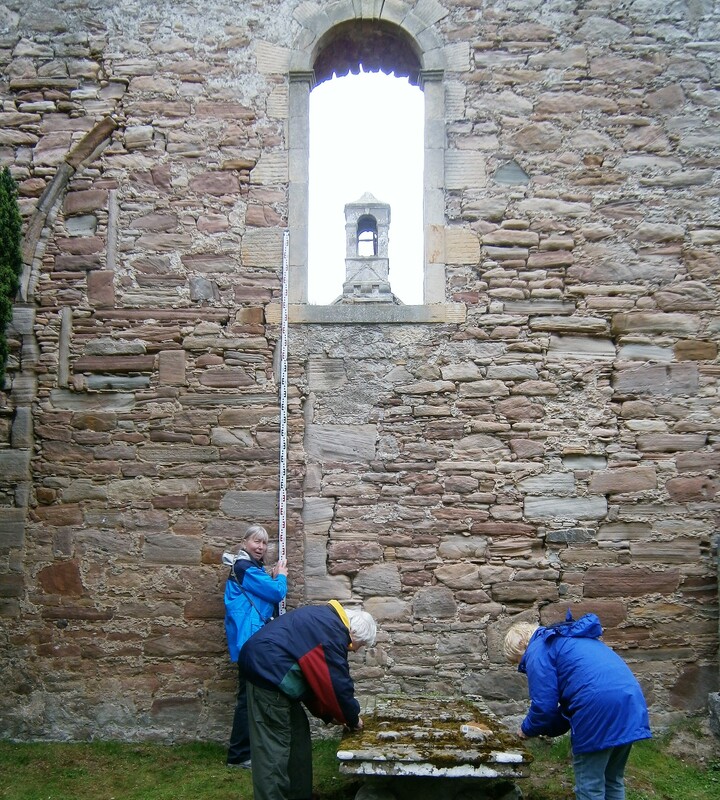 Many of us participated in a standing building survey of the ruined chapel led by archaeologist Lynne McKeggie. We were particularly interested in evidence for different periods of architecture. During one session within the chapel interior we were pleased to find a large, old iron key hidden within the debris. We showed it to a Nosas expert and believe it to be a mislaid 19th century kirk door key. Historical information that follows is based upon our group research to create posters and information boards. The chapel, rebuilt after the reformation, retains medieval features including an arch and buttresses. We saw no physical evidence within the ruined chapel of pre-reformation burials but they are now probably deep below the ground or may have been moved, however evidence of the earlier, pre-reformation church can still be seen in the ruins. Although the current structure dates back to 1790 when it was rebuilt by the principle Munro families at a cost of £700, records show that there was a minister here at Kiltearn as early as the 13th century. Whether there was a church at that time is unknown, but by the 1500s there was a medieval church with a thatched roof on the site, standing at the centre of a thriving community at Kiltearn, with several croft houses, an alehouse and a mill. During the 1700s the settlement moved inland. The village of Evanton was laid out and constructed at the beginning of the 19th century and this new church that could seat 700 people continued to serve the community for the next 150 years until the 1950s when it finally shut. Perhaps it was too far and therefore inconvenient to the congregation? In the early 1960s the slates were removed, sadly its roof collapsed and the building quickly fell into disrepair. The pulpit was removed and went to Lochgoilhead church where it still remains. The pews were removed to Evanton’s new parish church, leaving only the remains of Kiltearn old Parish Kirk standing. When the building was expanded in 1791 it incorporated some of the older stonework and today you can still see the outline of a curved window clearly visible on the east gable wall. Perhaps this was left as a token of respect or reminder of the past? Maybe it was just convenient to leave it there. We noticed shells, mainly conch, placed beside graves. Seashells are an ancient Christian symbol referring to religious pilgrimages and spiritual protection. Pilgrims wore scallop shells and they marked pilgrim paths. A lovely suggestion is that a seashell left on a grave is to indicate a loved one’s pilgrimage to the deceased, leaving a shell behind as a reminder. The ancient burial ground was planned by Alexander and Susan Kruse with a little help from their friends. All visible graves were allocated a letter (indicating graveyard area) and a number. We discovered many graves hidden within foliage etc and added them to the list. Recorders used a convenient shortened version of a form supplied by archaeologist Stuart Farrell to record in the graveyard. 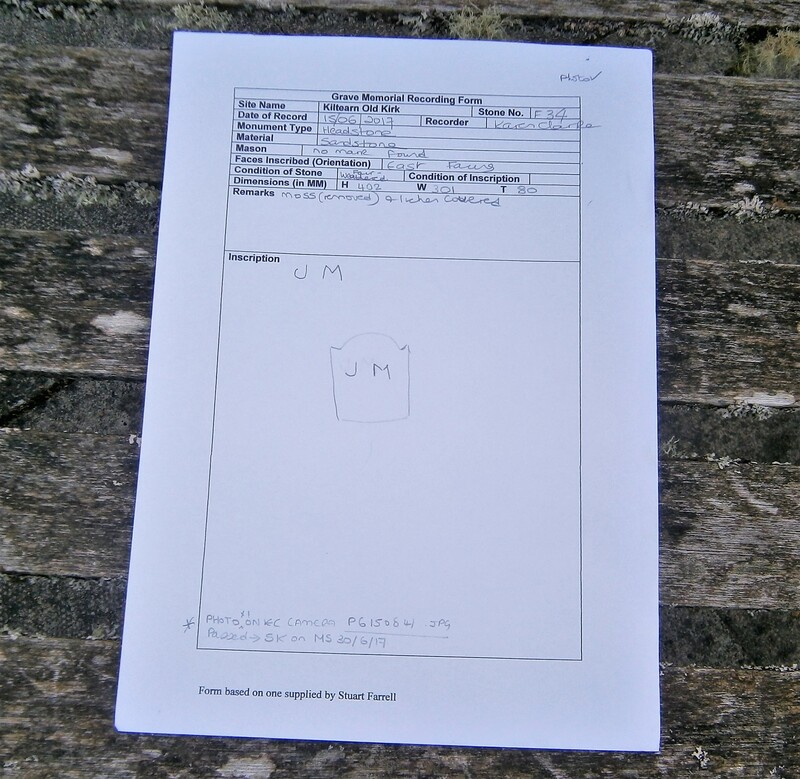 We also referred to the more detailed Council for Scottish Archaeology Grave Yard Recording Form (www.councilforscottisharchaeology) which has many useful sections including those depicting funeral architecture and symbols. All graves had a form, drawing and photograph. These were collated and printed by Anne Macinnes (Nosas) to form a resource available to the public. 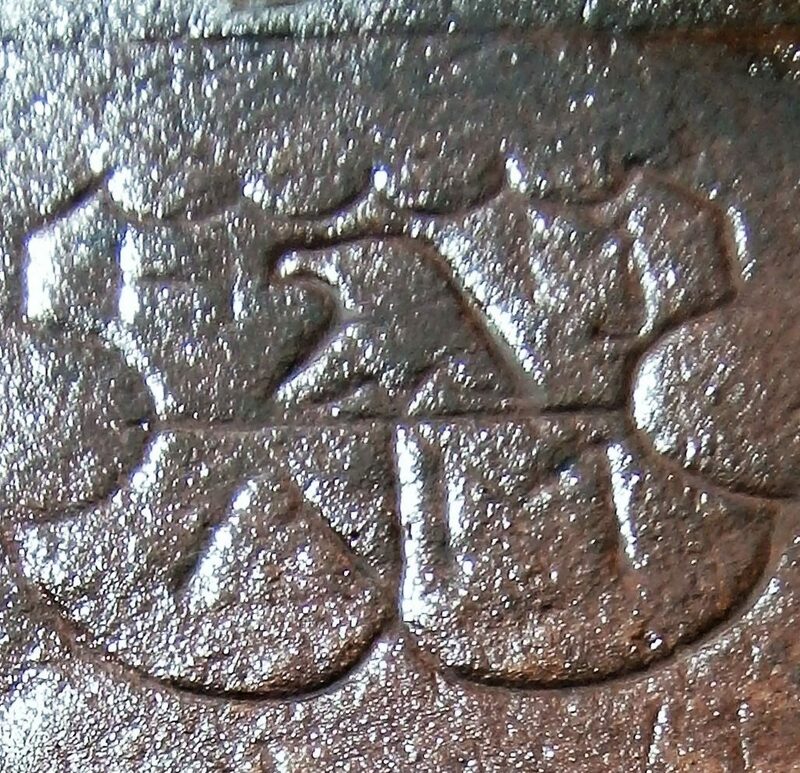 Example of Modest Memorial Recorded on Form Supplied by S. Farrel. (K. Clarke). 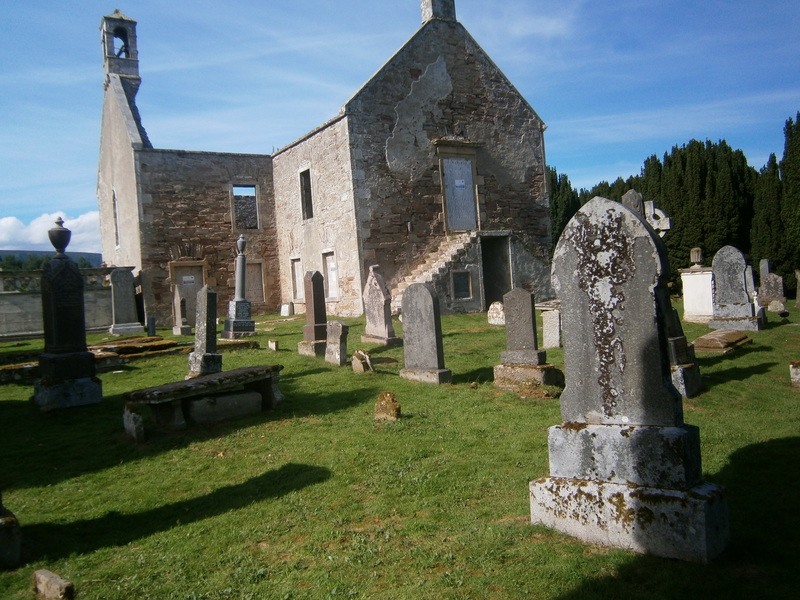 Kiltearn ancient Kirkyard contains over 400 burials. Families purchased lairs in which they and many of their descendants could be interred. The council lair plan dated 1905 lists 363 lairs which could be marked by enclosures, stone markers or the small iron markers introduced in the 19th century. These are vulnerable to removal and displacement. 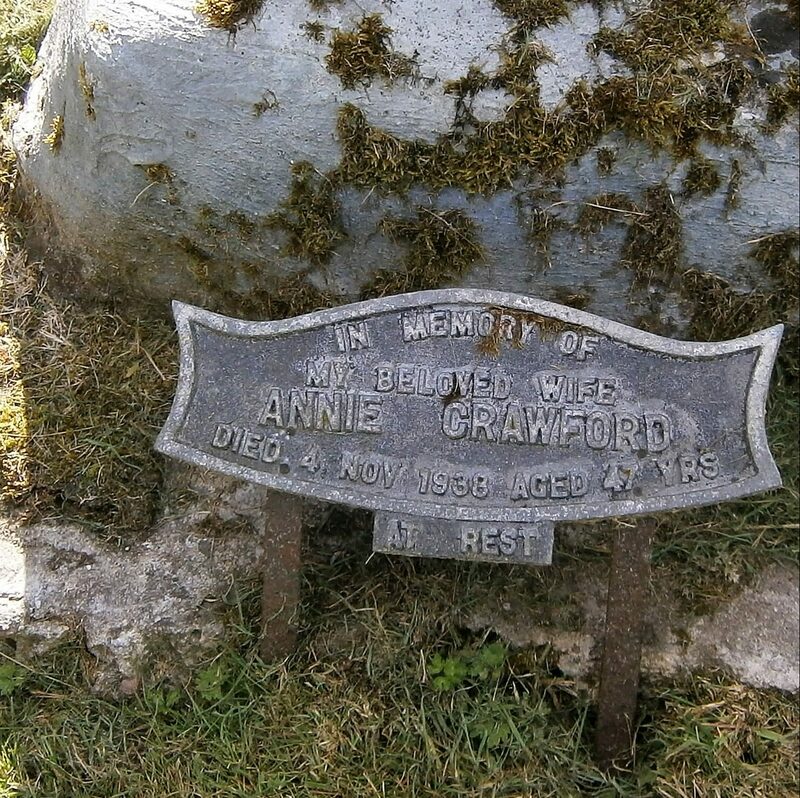 Stone markers can be difficult to differentiate from small headstones such as those erected for burials of infants or poorer folk. Access to the lair plan was of great value to the project planning and research. Recording beside the East Wall of the Chapel. (S. Kruse). It is often said that death is the great leveller. Poor lie alongside rich. Kiltearn funeral architecture, both simple and ornate, reflects this. We discovered wall monuments, murals and table tombs. There are headstones, obelisks and freestanding crosses as well as grave slabs – many carefully revealed and viewed for the first time this century. 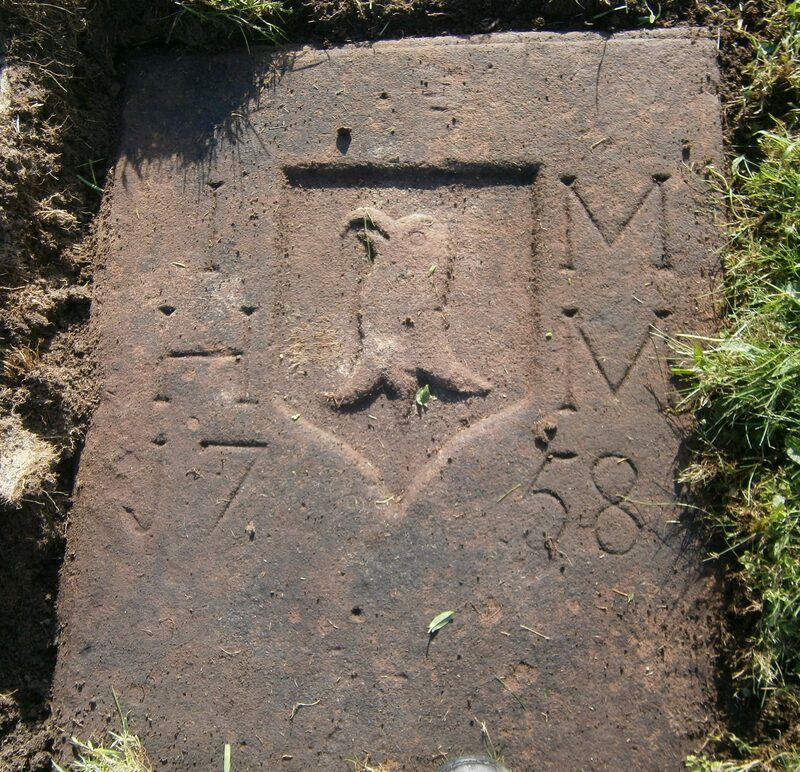 The earliest slab we recorded was dated 1670. 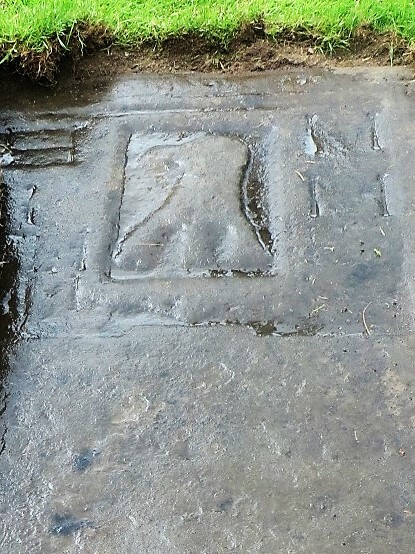 Some grave slabs feature drains ingeniously carved out by the mason to divert water and aid preservation. Most are constructed from local sandstone, granite (polished and unpolished) and even marble imported from Italy, one is metal another wood, both uncommon. Sculpture, much of it symbolic includes columns (broken ones indicating a broken life, sorrow, a life cut short), obelisks (the Egyptian symbol for the Sun God Ra who held the power to create so representing eternal life), angels (symbolising resurrection) and urns (a Greek symbol of mourning and the body as a vessel for the soul) or draped (death, often of an older person also sorrow and mourning). Many are naturistically ‘rusticated’ (where the stone is treated to produce a rocky or wood-like surface), some decorated with symbolic flowers and foliage. Headstones, table tombs, slabs, enclosures & columns topped with urns. (K. Clarke). Below: Rare Metal & Uncommon Wooden Memorials Beside Stone Lair Markers. (K. Clarke). These were popular in Scotland particularly during the 19th Century. There are yew trees in the cemetery which as an evergreen represent life after death. These beautiful trees hide some of the memorials, the roots are quite invasive and overlie grave slabs. We recorded symbols of ivy (friendship, fidelity, faithfulness and evergreen memories), roses (love, beauty, hope, goodness and sometimes associated with the Virgin Mary, “a rose without thorns”), laurel (achievement, distinction, heroism, worldly accomplishment). These can be difficult to find, often at the side or below the ground and include local masons and surprisingly one from London. Perhaps the mason travelled to Kiltearn? Epitaphs are not always an accurate historical record. They include eulogies and religious text on the main body of stones and around edges and borders of early slabs. Some of them are very detailed and difficult to read. A particularly challenging, long inscription was the tomb within the enclosure of Hector Munro of Novar. Modest stones of poorer people, equally important to our research, may have no inscription, just initials. The often seen HIS monogram is the Greek contraction of the word Jesus or abbreviation of the Latin phrase “Jesus, saviour of man”. Epitaphs are in different scripts, some mixed. Others, rather charmingly, have spelling mistakes, evidence of the mason or apprentice correcting text or a word spilling onto the line below as the mason ran out of space. At Kiltearn one lady merely merits initials embedded within copious text commending her menfolk. One gravestone is said to commemorate an ancestor of James Munroe, 5th President of the U.S.A. An interesting tombstone near the southwest door of the church is that of Thomas Hog who became minister in 1654. During turbulent times, he was forced from the church, imprisoned for holding illegal services and fled to the Netherlands where he became Chaplain to William of Orange. With the restoration of William and Mary he returned and was reinstated in 1690 only to die in 1692. Reading epitaphs can be extremely time consuming and requires ingenuity to obtain correct lighting conditions. We also adopted a technique rather like reading braille and carefully felt letters with our fingers when it was impossible to read them visually. As we became more experienced within the context of the burial ground we were able to recognize words where some of letters were missing or too badly damaged to read. We often worked as team with especially difficult inscriptions. 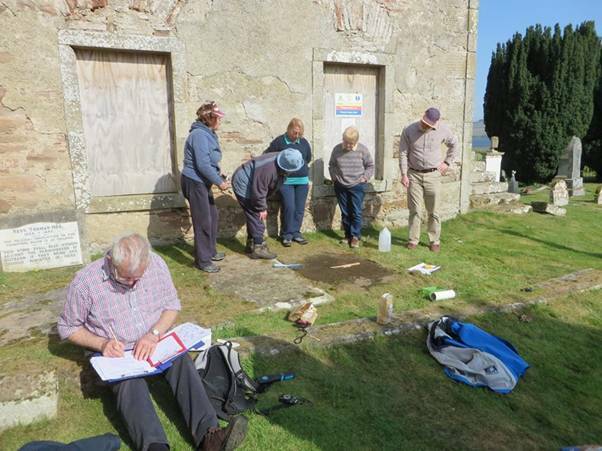 Sometimes a group of recorders would have been standing around a particularly challenging inscription for ages, debating the words and meaning when a friendly visitor to the cemetery would arrive, come over to see what we were up to and with a fresh eye cheerfully decipher it quickly! We used torches, doused stones gently with water and balanced on step ladders above the stones. We took advice from experienced members of the Nosas Scottish Rock Art Project and experimented with Reflectance Transformation Imaging (RTI), a computational photographic method that captures a subject’s surface shape, structure and colour with inter-active relighting. We investigated photogrammetry – the science of making measurements from photographs with some of the early, more degraded and therefore difficult to decipher stones. However much of the time it was all about being prepared to lie down on the job. 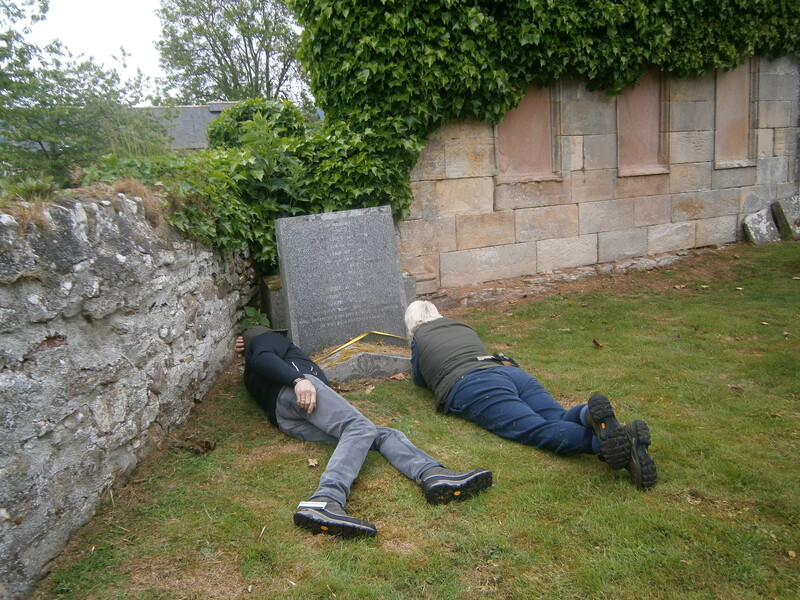 Reading Epitaphs and Searching for a Mason’s Mark. (Karen Clarke). Recorders discovered various compelling symbols of mortality and immortality. These ‘stony testaments’ invite the viewer, both literate and illiterate, to remember death and contemplate the hereafter. Symbols of Mortality represent the inevitability of death. Symbols of immortality offer hope in representing the resurrection and eternal life. These include cherubs (the soul) and winged angels, an obvious religious symbol. Wings may be interpreted as carrying the soul to heaven. 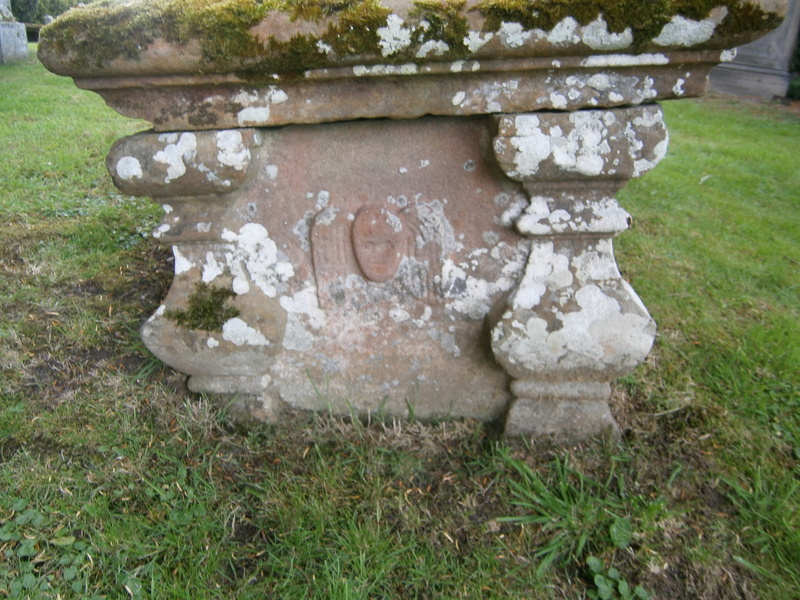 Sandstone Table Tomb with Winged Soul. (K. Clarke). Anchors represent hope. Mortality symbols at Kiltearn include death-heads some baring teeth others adorned with the status symbol of a wig (after all if you were a wealthy or important individual why not have your skull depicted in a wig?). Another features an hour-glass (symbolic of time running out) pouring sand into the skull. There are crossbones (usually femurs), coffins, winding sheets and the sexton (grave-diggers) tools of spade, turf cutter and pick. There are also memento mori (artistic reminders of the transitory nature of life) and include the Deid or hand bell rung to give notice of funerals, a popular symbol in Northern Scotland. 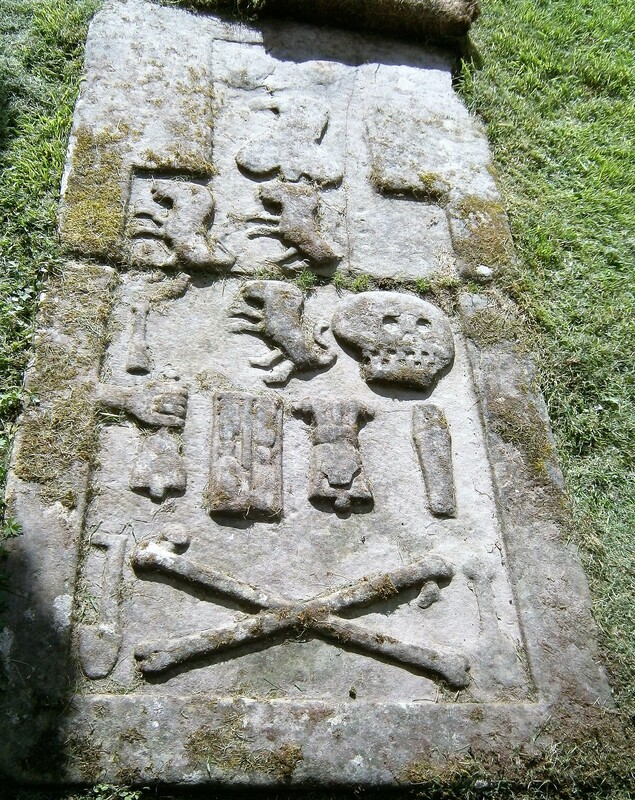 Above: Grave slabs with symbols of mortality, immortality, beasts and red eagles. (K. Clarke). We recorded quite a few set squares and compasses. These may represent tools of trade and indicate an architect but within the context of Kiltearn we believe them to be masonic symbols. Heraldry is a specialised subject with local influences. Heraldic devices at Kiltearn include beasts as shown above. Perhaps these are naïve depictions of rampant lions? Lions represent strength, the power of God, the beauty of the immortal soul and guard against evil spirits. Symbols of eagles represent courage and a possible military career. 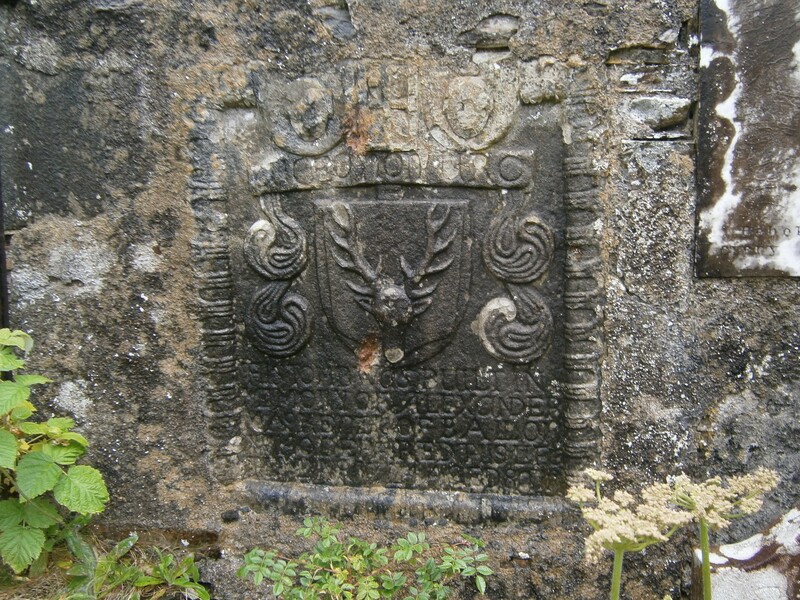 There is a rare symbol, possibly unique to Kiltearn burial ground – the head of a red eagle in profile. Imagine our delight in identifying eleven in total. They are all slightly different especially with respect to the beak. Many are enclosed within different shaped shields, others feature an eye detail. Some are less fierce than others but all are rather special. All have a ragged neckline indicating that the head has been violently torn off. Perhaps symbolic of strength? The red eagle is associated with the crest of the Munros of Foulis Castle, the local landlords or main heritors who were involved in the church organisation, including appointment of ministers, sometimes without consultation which did not always go well. The appointment of Thomas Munro, a school master, in 1816, led to a low point in the history of the church when most of the congregation left to go to an alternative chapel. Although the parish church could hold 700, during his ministry less than 20 would attend. The celebrated 19th century writer Hugh Miller, after walking from Alness to Kiltearn, to attend a service wrote somewhat ironically about the “skeleton congregation”. 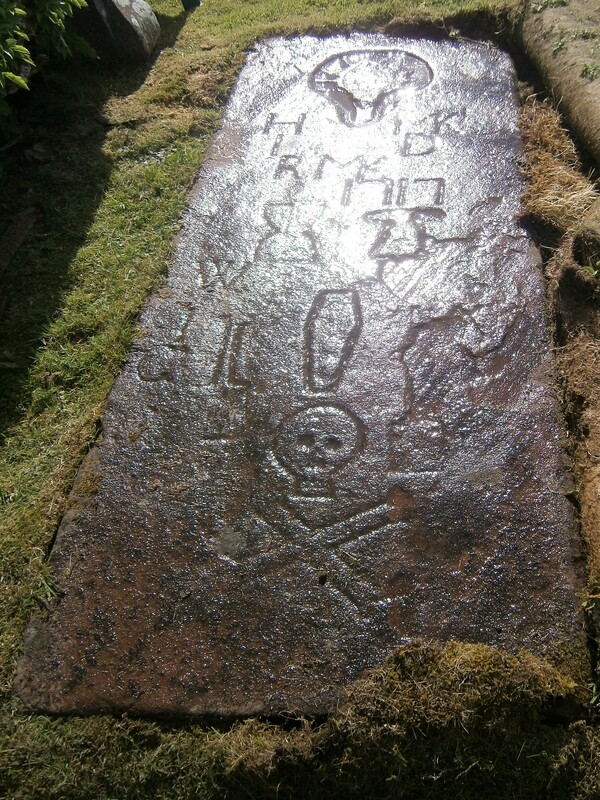 Above: Grave Slabs with Red Eagles in Shields, Dates and Munro Initials and Red Eagle with Wigged Skull & Crossed Bones. (K. Clarke). In the 1790/1791 church the Munro of Foulis had a special loft with two fireplaces to keep them warm between services. Impressive stone stairs lead up to the loft can still be seen. The current family were very supportive of our research. View from South Showing Steps Leading to Munro of Foulis Loft. (K Clarke). 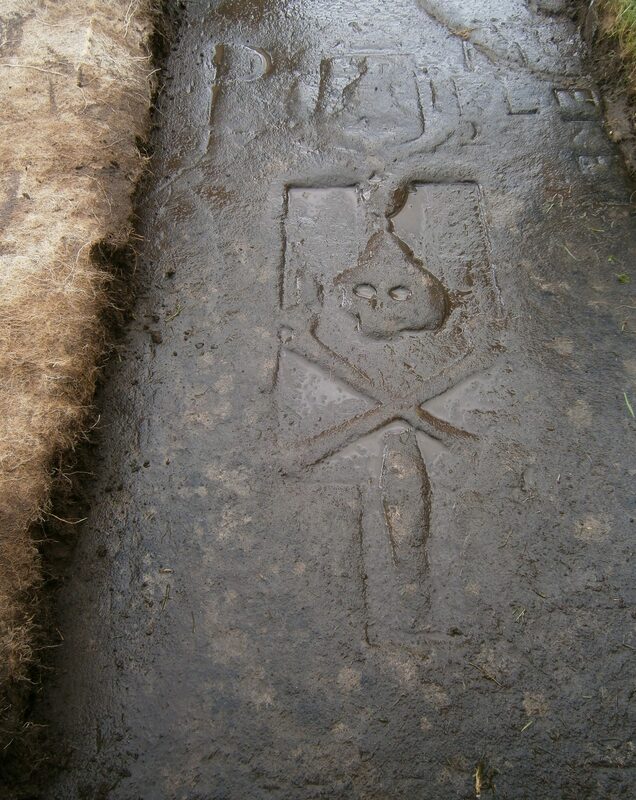 We also found one example of a stag’s head, a McKenzie device, on a 1717 slab with hourglass, possible anvil (a symbol of martyrdom), coffin (mortality), skull and crossed femurs (also depicting mortality). A few weeks later on another Nosas adventure, walking the coffin route between Lochbroom and Dundonnel, we were delighted to come across another McKenzie stag on a fine wall plaque in Clachan Church Burial Ground. There is yet another recorded at Kirchmichael Ancient Burial Ground. Top: McKenzie Stag Wall Plaque (Clachan). 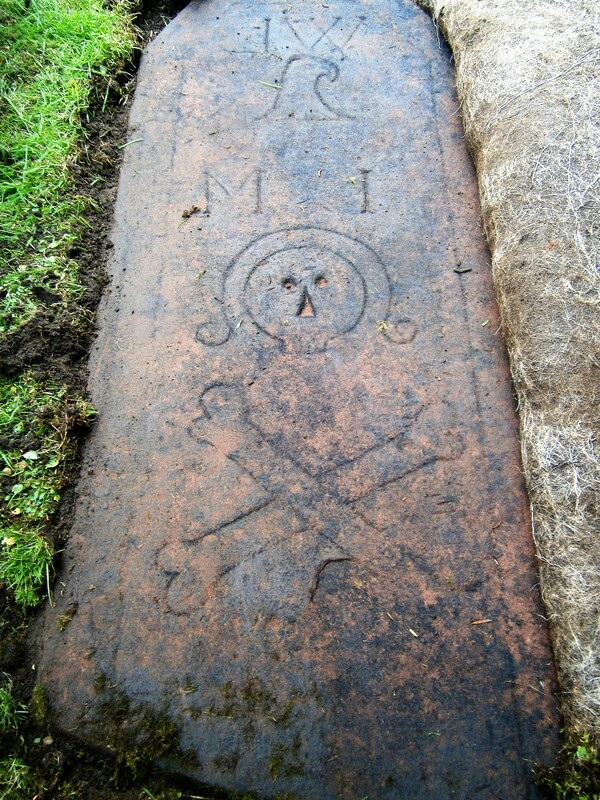 Above: memento mori (Kiltearn). (K.Clarke). Coffin routes, corpse roads or kirk ways were the paths used by remote communities to provide a practical means for transporting coffins to the cemeteries of churches with burial rights. 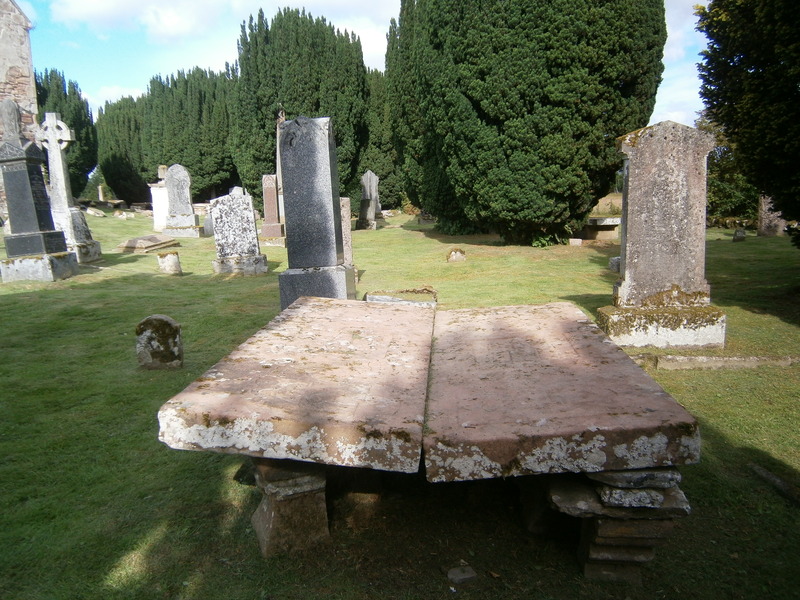 Some retain interesting features such as coffin stones upon which to rest the heavy coffin allowing bearers a break. They may incorporate water such as bridges or stepping stones, believed to prevent the deceased (who apparently avoid crossing water and dislike mazes even more) from returning home. Burial practices such as having the feet of the deceased facing away from the family house to stop them running back home are as fascinating as the memorials. We did not research such practices at Kiltearn but they are another interesting area of investigation. In Christian cemeteries headstones face East, a symbol of anticipation of the second coming of Christ. We hope our findings will help safeguard the historic site of Kiltearn Ancient Burial Ground and Chapel for the future. Dying is as natural as living and cemeteries are reflective, invariably tranquil places to spend time in. As Nosas reaches its 20th anniversary I inevitably think about its past achievements and most importantly members and friends we have inevitably lost over the years. Looking towards the future, I hope there will be many more Highland burial ground recording projects. There are already plans afoot! Bailey, C. (1975). Harrap’s Guide to Famous London Graves. Harrap. Beach, D. (2013). London’s Cemeteries. Metropublications Ltd.
Friends of Highgate Cemetery. Highgate Cemetery Victorian Valhalla. (1984). John Murray (publishers) Limited. Longmore, L. (2000). Land of Churches. Published by author. Miller, H. (1860). My Schools and Schoolmaster. Willsher, B. (1985). How to Record Scottish Graveyards. Council for British Archaeology. Willsher, B. (1995). Understanding Scottish Graveyards. Council for Scottish Archaeology/NMSE Publishing. Willsher, B. (1996). Scottish Epitaphs. Canongate Books Ltd. There is a signboard outwith the ancient burial ground erected as part of the Kiltearn Old Parish Kirk Community Research Project organised by Evanton Community Trust. Further information about the kirk and this project can be found at Cornerstone Café in Evanton and in the Dingwall and Alness Libraries.